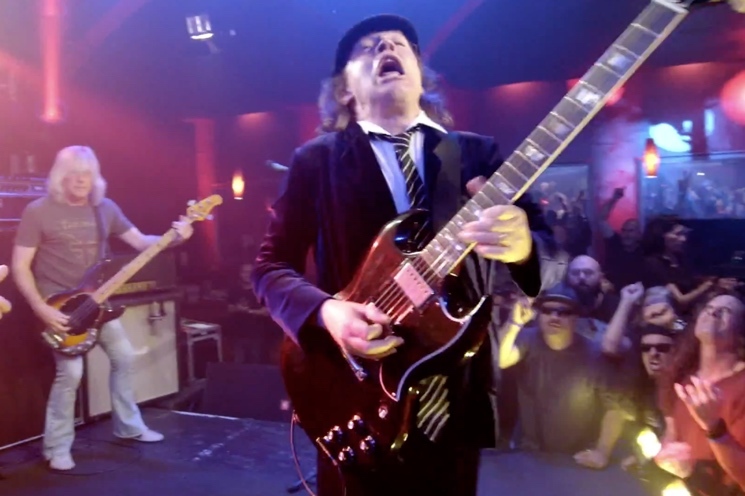 A Toronto man fundraising for Alzheimer's disease charities has received a major boost from AC/DC, with guitarist Angus Young donating $19,260 to the cause. As CTV reports, Steve McNeil has been travelling across Canada to skate for 19 hours and 26 minutes in all seven of Canada's NHL cities, raising money and awareness for local Alzheimer's societies. McNeil's 1926 Skate campaign began in honour of his late mother, who suffered from Alzheimer's for nearly 20 years before she passed away in 2012. McNeil began the campaign that year, naming it after the year of his mother's birth. As for the connection to the Australian rockers, McNeil told CTV he's been a fan since he "accidentally saw them" in 1978, and uses their music as the soundtrack to his skates. The band's Malcolm Young died from dementia in 2017 at age 64. During his skate session in Calgary this past weekend, McNeil was approached by a man who turned out to be the son of AC/DC drummer Chris Slade. As he told CTV, "I shook his hand and said, 'It's too bad — is your dad battling Alzheimer's?' And he said, 'No, my dad is the drummer from AC/DC.'" Slade soon hopped on a video call from Las Vegas, with the band's management reaching out with news of Young's contribution only two days afterwards. CBC adds that the band's accountant, Vicky Granados of Prager Metis, had written to the broadcaster for more details of McNeil's campaign after Young and his wife had come across and article about the skates. "It's like touching an emotional lottery. You've got to understand, this is what's been my driving force," McNeil told CBC. "When I go out in these conditions, that's all I listen to because it's my tribute to Angus and the boys — because I know they lost a big part of their family." Donations to McNeil's cause can be made through his website until June 30. It was reported last year that recordings from the late Malcolm Young will be included on a forthcoming AC/DC album.